From the United States, via David Cay Johnston of Tax Notes, an article entitled Income Inequality: 1 Inch to 5 Miles. 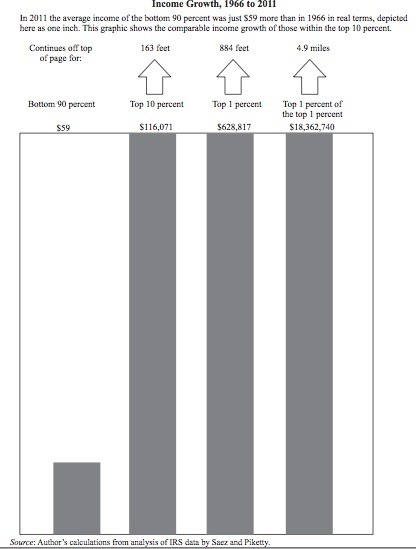 This graph shows that, among other things, the adjusted gross income (AGI) of the bottom 90 percent of the U.S. population rose by just $59 in 2011 dollars in the 45 years between 1966 and 2011, while the AGI of the top 1 percent of the top 1 percent (ie the top 0.01 percent) rose by $18.4 million. "For each extra dollar of annual income going to each household in the vast majority, an extra $311,233 went to households in the top 1 percent of the top 1 percent. One inch to almost five miles. What do you think will happen to our tax system, and to the United States, as tax policy helps extend that line to 10 miles?" More horrifying stats in the main article.